I recently got in touch with some folks via craigslist about playing in a cover band. What I really want to do is play with other people regularly-- I don't particularly care if it's in front of other people or in someone's garage. This particular band, however, is looking to play shows a couple of times a month. Sounds fun to me. I let them know where I thought I was as a player: still a novice, but not embarrassingly awful. We agreed to get together and play and see if I was a fit for their band. They sent me their setlist of 17 songs and I agreed that I would have 5-10 ready to play when we got together. That gave me just under a week and a half to get these songs under my belt. On first glance through the list, I knew 16 of 17 songs. I pulled up the 16 I did know from my music collection (or YouTube for the songs I didn't have) and listened to them all, focusing on the bassline. I also did a quick bass tab search as I went along to get an idea for key and general difficulty level. As I listened, I immediately began to sort the songs into difficulty buckets. "Kiss Me Deadly" by Lita Ford? That's an easy one. "You Oughta Know" by Alanis Morisette? That shouldn't be too hard... wait a second, that's a really busy bassline. Who played that? Flea? Oh crap, that goes in the "hard" bucket. After my initial sort, I had 12 songs I thought I would try to learn. 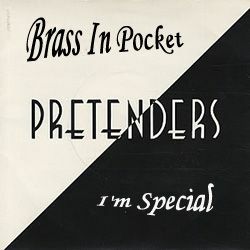 Here's how I went about learning "Brass in Pocket" by the Pretenders. I looked through a few different versions. There was quite a bit of variety when it came to complexity. Some people thought it was a really simple bassline. Others thought it was pretty complex, with lots of octaves and fills. Next, I tried using my ears. Using the tab as a rough guide, I next tried to play along with the song, using my ears. This went... okay, I suppose. I knew there was a lot happening that I wasn't playing, and there was some stuff going on that I just couldn't hear. Once I has a rough understanding of the song, as well as the parts that I knew I needed to work on, I needed to solidify my understanding of the song's arrangement. For this, I charted out the different elements of the song (the verse, the pre-chorus, the chorus, the outro), and then I wrote out the chord changes for each of those parts. I then started working through each part. After this step, I was feeling pretty good-- I could play the root notes of the chords to the entire song. But what about the fills? For polish, I started watching YouTube covers of this song; specifically, I watched bass players playing along. This helped me understand some of the tab I looked up initially. It also helped me undestand that I probably wasn't going to be playing it just like the record. The covers ranged from simple (basically the root notes I already had down) to the virtuosic-- there was no way I was going to play like some of those guys. In fact, I'm pretty sure that the recording isn't nearly as busy as some of those covers. The YouTube videos also helped me make another discovery: the bass on the recording of "Brass in Pocket" is in drop D tuning. Once I had all this information, it was time to synthesize it into something I could actually play. I decided I was going to keep things simple. I decided I would play in standard tuning. This meant I didn't always get the same tone that the recording had, but it still sounded pretty good to me. I was going to only attempt the "signature" fills and variations. I'm not good enough to get real fancy and still keep the rhythm rock-solid, so I wanted to focus on being the foundation rather than being true to the recording. The slide in the intro. The quick fill on the end of the two bars of A in the verse. The fill at the end of the song. For variations from the root, I would play the A octaves in the chorus (they're pretty prominent in the recording) and then toss in the A octave on beats 2 and 4 in the outro. I have to say, I'm pretty happy with how it turned out. I started with the bare bones of the song, and then added signature lines and fills to add flavor. I used tab and YouTube videos as reference, but I never relied on them as blueprints to the song. Instead, I used them as a map to get there on my own. It's great to have a reference, but I never relied on them memorize parts. Instead, I focused on understanding the song, the structure and chords changes, how the fills worked as transitions, and how it all fit together with what the rest of the band would be playing. The biggest lesson I learned from this process is that I don't need to learn songs, I need to understand them.